Name a famous person whose first name is seven letters long and ends with the name of a bird, and whose last name is also seven letters but starts with the name of a bird. Hint: One of these birds is the general name for the bird, and the other is a specific type of bird. Who is it? That's Pierce, the hawk. 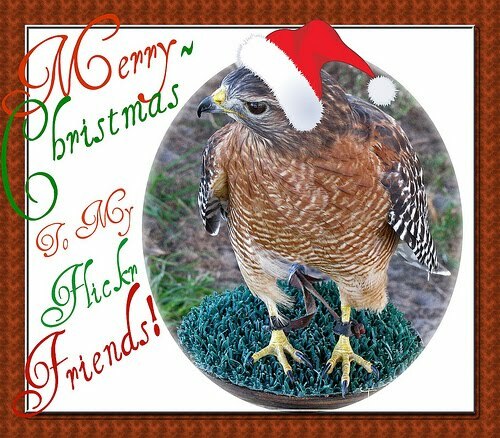 To read more about her (yes, they know it's a girl hawk), go to her Flickr page, which is headed, "Hawk, the Herald Angels Sing." Only, I didn't think hawks sang very well. Raptors are not exactly song birds. Oh, and I looked. Oddly enough, there weren't any quirky Flickr photos of hens. We eventually got to the correct answer by thinking of potential first names. Having got to Stephen, we couldn't fail to notice the possibilities in the humorist Stephen Leacock. He might have been the basis for an ever better puzzle ... if anyone now has heard of the man.